As I was wandering around the Crimson Demon Village, I stumbled upon Aqua shadowboxing. That’s the same technique the Crimson Demons showed us the last time they were here where they used light refraction magic to make us think that they’ve teleported. As Aqua chanted the spell, the sound of someone gasping in surprise and rolling out of the way could be heard in response. Darkness and Megumin stumbled upon us. Darkness grabbed my collar before I could get to work. 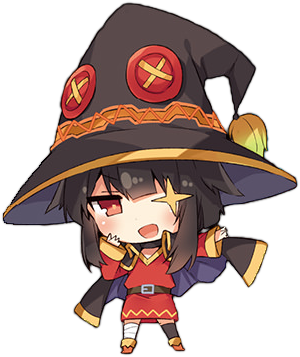 Megumin pointed into the distance. Standing right there was Yunyun who was being greeted by the passing Crimson Demons. Probably being embarrassed by being addressed with those titles, Yunyun’s face was bright red and tears clung to the sides of her eyes. In response to my honest answer, Megumin frowned. Seemingly at her limits, Megumin walked over to Yunyun at the center of that crowd. Seeing the sudden appearance of a rabid dog, the Crimson Demons who were crowded around Yunyun quickly dispersed. At a place far away from Axel. “The one with azure lightning behind her”, sounds like a title given to someone who eats too many beans, imo. Actually already asked something with that. From the name I’d assume that was actually the only question. I feel like I’ve been through this a few times before. Deja vu? Deja vu I’ve been to this plave before. Atama ga Okashii Bakuretsu Busume?